Puede ser difícil obtener una visión general completa de San Petersburgo en un tiempo limitado. Aproveche al máximo su tiempo en el puerto en un tour de 2 días y marque una serie de puntos destacados con una rápida transferencia en un vehículo Mercedes. 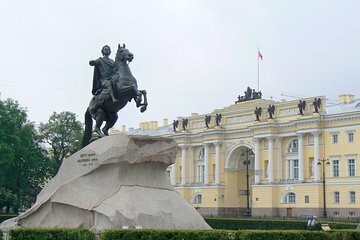 Visite las atracciones que incluyen el Palacio de Catalina, el Palacio Yusupov y el Museo Estatal del Hermitage y aprenda sobre su historia con su guía, evitando costos ocultos con tarifas de entrada incluidas en el precio. Evita los costos ocultos con entradas y un almuerzo tradicional incluido. A smaller tour company that provided us with an outstanding tour for our group of six in a mercedes van. We were able to go from stops to stops in a timely manner, without having to waste time waiting for anyone. No problem zipping around the city's traffic, whereas the big tour buses have to slowly crawl through the congestion . Our tour guide spoke perfect english and worked enthusiastically to show us the sights. We were able to visit the Hermitage museum on a day that is closed, because of the connections of the company owner. Pretty much the six of us in a totally empty museum. No crowds, no lines even though there were four cruise ships in port that day. The fees they charged are less than the ship's tour price, and you could see a whole lot more in 20 hours visa free. Highly recommended, it's a no brainer.